← I Need You, I REALLY Need You!!!! I received an SOS yesterday, a bedroom SOS. Bedrooms are tough. When you’re a girl you want it to be fluffy, cozy, fun prints, ladylike…. you get it, but when a man gets involved you need to remember he needs to sleep there too and waking up with sequin imprints on his face is not fabulous. HOWEVER we must also not let it be too dude. Let’s be serious, there comes a time that we mature and no longer want to wake up in a boy’s dorm room (KIDDING). There needs to be a balance and that balance is CRISP, FRESH, CLEAN. Unless one or the other doesn’t mind, you both need to be happy and crisp, fresh, and clean are always chic. Back to my SOS. The current state of the bedroom is, and I quote, a “man cave”, “the walls are so bare…it’s small…wooden dressers are shoved in the corner”. I needed some inspo, so I headed on over to my trusty Pinterest boards and found magic. 2. 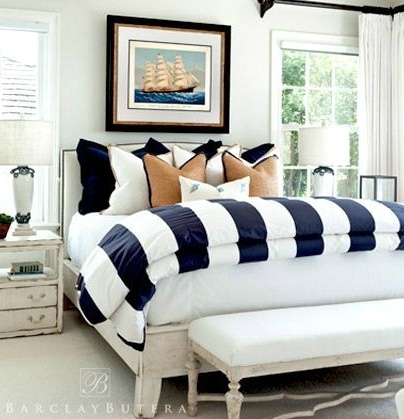 Navy Striped Bedding: FRIGGIN TARGET!!! 30 DOLLARS!!! Get some fresh white linens and maybe a textured white knit throw and call it a day. 3 and 4. 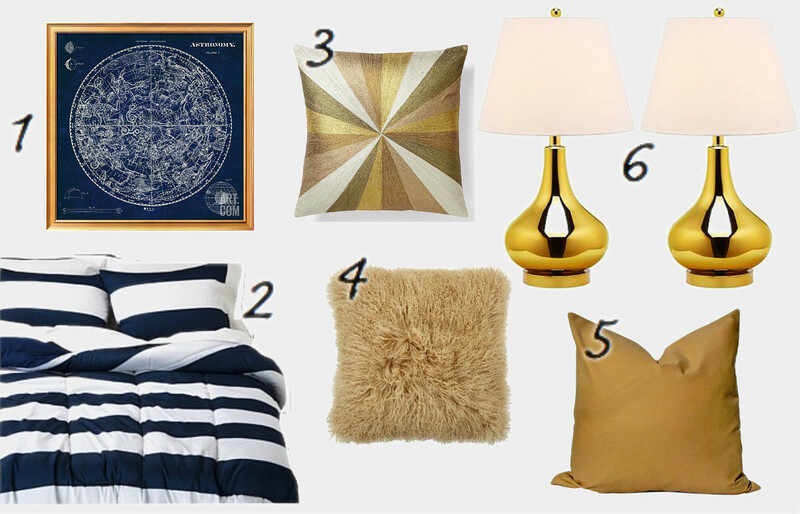 Shimmer Bullseye and Fuzzy: You can take the girl out of the room but not the room out of the girl, ok that makes no sense but glam can be safely added in the throw pillow. Throw one of these suckers on with simple pillows and it’s just the right amount of roar. 5. Camel: Alright, alright, if you want to be boring snoring and play it safe here’s a pretty cheap camel pillow. Get 2…. then add something fun… no but this is a great look, I love camel and navy. 6. YAAASSSSSS GOLD GOURD LAMPPSS!!!!! : a thousand times over, yes yes yes yes. These are PERFECTO! A little bit of class and some zhushing up. See what I did there, manly, stripes, lady, gold. How about it? I have to get in their dwelling to help visualize the furniture situation, but I think with the gold and the wood it’ll be a nice mix. Might have to get creative with the setup but that’s the fun part! This entry was posted in Bedroom, Get the Pretty, Inspiration, Interior Design, Other People's Digs, Vice Numero Uno = Pinterest and tagged decor, decorate, design, glam, gold, home, home and garden, home decor, inspiration, interior, interior design, interiors, master bedroom, mood board, pinterest, preppy, pretty, target. Bookmark the permalink.